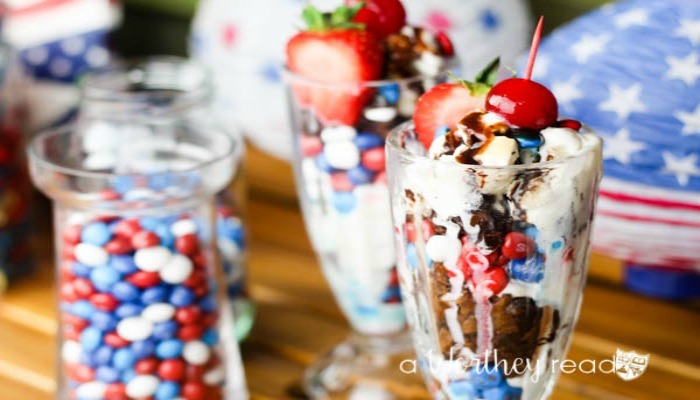 I am feeling patriotic so in the spirit of all things patriotic I am just going to pledge allegiance to our Red, White and Blue Ice Cream & Brownie Parfaits. Showing die-hard loyalty to such a delicious creation isn’t very hard to do, especially when it’s this good. Check your calendar ’cause summertime in the good ole U.S. of A means there is gonna be a fair share of celebrating and honoring our heroes (as it should be). And having served in the United States Air Force, I get it. I have innumerable reasons to be equally proud to have served. And doubly appreciative and thankful for all of the men and women soldiers who served before, and those who are actively serving. And my hat is off, and my head is bowed for those brave Americans who have made the ultimate sacrifice. So, if you know, a veteran thank a veteran and shower them with lots of respect and love. And who can forget our national birthday? This year we will mark 240 years of independence and democracy! And yes, THERE IS something pretty darn important behind all of those hot dogs, hamburgers, parades, and spectacular fireworks. So, in honor of all of our veterans (past, present and future) and with a nod to July 4th The Worthey’s are throwing our red, white and blue hat into the ring with a very star-spangled dessert! And this isn’t just any old parfait either, nope not even close. We went big and baked up our favorite double chocolate and cherry brownie, added creamy scoops of cookie dough ice cream and fresh sweet strawberries and a cherry on top (literally there is a real cherry on top). But the real “cherry” on top is the special edition M&M’s® Red, White, Blue Milk Chocolate, M&M’s® Red, White, & Blue Peanut and Skittles® Red, White, & Blue layered ever so sweetly throughout this mouthwatering dessert. Using a parfait glass start layering the ingredients. Add about a tablespoon and a half (1 1/2 Tbsp ) of mixed M&M’s® Red, White, & Blue Milk Chocolate, M&M’s® Red, White, & Blue Milk Peanuts, and Skittles® Red, White, & Blue. Spoon in the chocolate brownie. Side note: Building an incredibly delicious parfait can be very messy work, reference my finger down below. Continue layering the ingredients until the parfait glass in filled. Top with sliced strawberries, chocolate syrup, and a Maraschino cherry. You can grab all three and more at your local Walmart. And if you’re like me then you love to share, and right now Walmart is sharing too with their “1 For You, 1 For the Troops” and here’s a fun historical fact: Did you know M&M’s® were created for the troops? It is true so let’s keep the tradition going and buy M&M’s® at Walmart. I got everything I needed at my local Walmart, which is very convenient. Do you know a veteran? If so, call them or visit and tell them, “Thank you for your service.” I also want to know (because nosy, okay!) what are some of your favorite 4th of July traditions. Leave me a comment below. Add about a tablespoon and a half (1 1/2 Tbsp ) of mixed M&M's® Red, White, & Blue Milk Chocolate, M&M's® Red, White, & Blue Milk Peanuts, and Skittles® Red, White, & Blue. Be sure to check our adult Red, White & Boom version!! Consider me so impressed! I’d make these for July 4th too. I love M&Ms more than.. most things. And your photography here is stunning. Those look delicious! I know how we’re celebrating the 4th of July! These are so cute! I need to bookmark this for our 4th Of July cookout. The kids will love it. now that’s a dessert to celebrate. So yummy adn perfect for any picnic. These look great! I can’t wait to try them for 4th of July! Yum city here. I am going to try these for the fourth of July. We always stay in for that holiday because the dog gets afraid. Nice treat for us, too. These parfaits look to die for! I can’t wait to try to make them! Yummy! One of my favorite ways to eat ice cream is with brownies and adding M&M’s is just delicious! Thanks for the idea. This party looks so fun! My kids would love to make these parfaits! WOW!! These look amazing! Such a perfect treat on a hot day. Not to mention I love M&M’s. I can’t wait to try these.